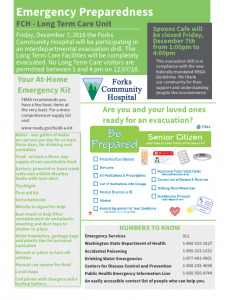 Friday, December 7, 2018 the Forks Community Hospital will be participating in an interdepartmental evacuation drill. The Long Term Care Facilities will be completely evacuated. No Long Term Care visitors are permitted between 1 and 4 pm on 12/07/18.